This classic Pullman with 5 roomettes, 4 double bedrooms, 8 duplex roomettes, and a shower is the perfect second car for a larger charter group. Car has original interior. Upgraded in 2004. 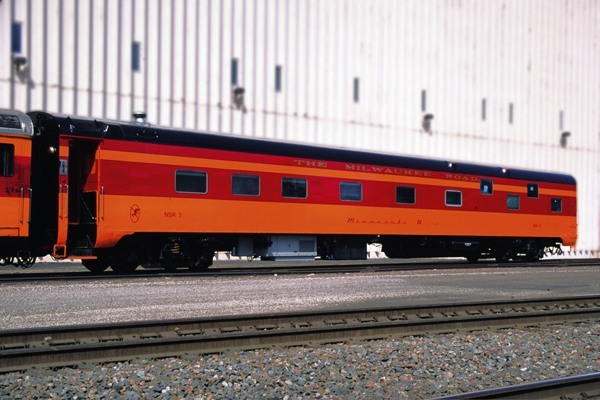 Built in 1954 by Pullman-Standard for service on the “Pioneer Limited” and “Olympian Hiawatha.” Among the last passenger cars purchased by the Milwaukee Road. Never used in Amtrak service, it was retained by the railroad for executive use until sold to first private owner in 1978. Operated in charter service 1984-1990. Acquired by the Friends of the 261 in 2001. Push-pull equipped.